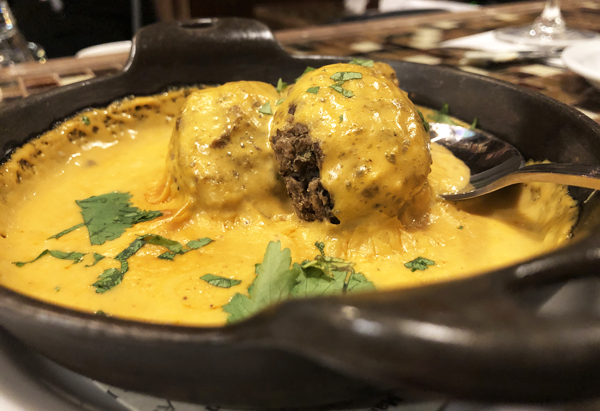 Quinoa and Lentil Meatballs from Mankas Steakhouse. With love in the air, it’s time to get out and celebrate with someone special at one of our delicious local restaurants! FAIRFIELD – The minute you drive up to this little historic hideaway and spot the cozy outdoor fireplace raging and the interior white linen-clothed tables surrounding a beautiful fully stocked bar, you know you’ll be in for a real treat. The greeting staff at Mankas Steakhouse is delightful. We chose to sit at the bar where we could peek into the kitchen and get a real feel for the ambience of the establishment. Kim, our wait staff, brought us warm bread with butter and began introducing us to a host of local wines and tasty specialty tapas. We chose a glass of the delicious BackRoad Vines Quattro 2016 from Suisun Valley, made just down the road, and began our tapas journey with their Calamari, served with sliced pepperoncini and lemon aioli sauce that was done to perfection. We immediately jumped to the hearty, rich, Mac & Cheese topped with White Truffle Oil, Applewood Smoked Neuskie Bacon and Maine Lobster served sizzling in a cast iron skillet – simply outstanding. On to the finale, where I ordered the Lentil & Quinoa Meatballs with Fenugreek Sauce and Cilantro. If you’re an Indian cuisine lover, this will be a must order, with the smell of curry surrounding you the minute it arrives. Mankas Steakhouse is a marvelous gem with Chef Peter focusing on garden to table cooking. Appetizers range from $9-19 with lunch and dinner items $9-36. The atmosphere is an upscale comfortable that still manages to be warm and inviting. Open Monday-Thursday 11-9pm, Friday-Saturday 11-10pm and Sunday 11-9pm. Enjoy live music on the patio every Thursday, 6-8pm and Ladies Night with drink specials each Tuesday. Mankas also offers banquet areas for party lovers, corporate events, socials and weddings. Make your reservations online or view the full menu and entertainment schedules at mankassteakhouse.com. Located at 2522 Mankas Corner Rd., Fairfield. 707-425-3207 | mankassteakhouse.com. 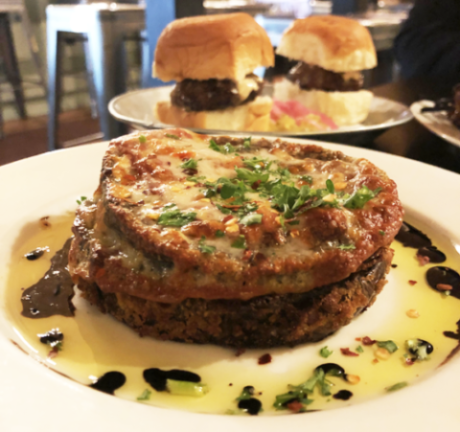 Eggplant Stack from Ficelle in Winters. WINTERS – Take a loving leisure drive to Winters and you’ll find Ficelle. Pronounced (fee-sell), this small, delightful, tree-engulfed modern farmhouse offers a fun, casual Spanish experience. The chalkboard menu is filled with specialty dishes, salads and plenty of tapas! We started with the Eggplant Stack and wow, was it! A modest $6.95 brings a delicious stacked eggplant, roasted red pepper and provolone drizzled with extra virgin olive oil and balsamic reduction. Love protein? Our server Mel suggested the Teriyaki Beef Skewers for $9.75, marinated and grilled in house-made teriyaki – yum! We finished with the Papas Ficelle, oven-roasted potato wedges with scallions, parmesan, queso fresco and a spicy dip. They also feature a rotating beer and wine menu, outside deck and take out. Open Thursday-Saturday 5:30-10pm. Located at 5 C E. Main St., Winters. Tacos Al Pastor from Santanas Cantina. 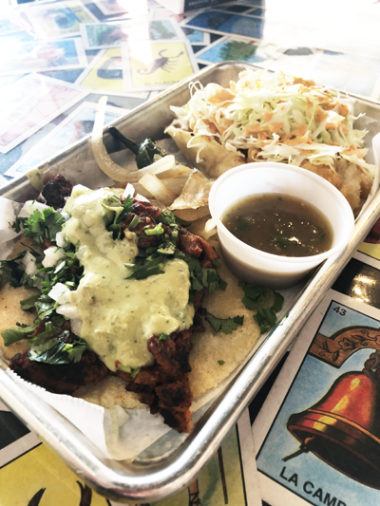 VACAVILLE – Santanas Cantina is a hip, colorful spot to enjoy small plates for lunch, dinner or happy hour. Open the door to immediately find vibrant wall art, fun table motifs and lively music. I ordered my favorite, the Al Pastor Taco, made with marinated sweet and spicy pineapple pork and topped with homemade Chile Verde sauce for $3.50. The mild Baja Fish Taco consists of beer-battered red snapper with cabbage and a homemade sauce for $4.25. The Street Dog also looked amazing, but our final take away was the new Chicken Quesadilla, filled with chunks of chicken and plenty of cheese! Find some love at Santanas Cantina, open daily from 11am-10pm and 11am-12am Friday-Saturday. Specialty margaritas daily and a full bar. Happy hour is weekdays from 3-6pm. Outdoor seating is available. Brandy Hart writes “Tastes of Your Town”, a monthly feature in the print edition of Your Town Monthly. This article was originally published in the February 2019 Solano and Yolo County print editions.